Located in the heart of San Antonio along the banks of the historic River Walk, the Omni La Mansion del Rio is where history comes alive. Perfectly situated for any visitor seeking to explore all of San Antonio's extensive range of tourist attractions. The property is within walking distance of the fabled Alamo and El Mercado as well as La Villita District, the Spanish Governors Palace plus the San Antonio Convention Center and other well-known landmarks. Blending Spanish Colonial architecture and European style, the four-diamond hotel surrounds guests with the romance and charm of a grand hacienda. La Mansion's enchanting combination of Spanish Colonial architecture, as well as its storybook setting and celebrated restaurant Las Canarias, plus its elegant accommodations are just a few of the reasons it has been voted as one of the Top 100 Hotels and ranked number 2 of the nations Top 50 family-friendly hotels by Travel and Leisure. Omni La Mansion's award-winning Las Canarias restaurant offers epicureans a romantic experience whether for breakfast, lunch or dinner. The elegant setting is enhanced by daily menu selections and the freshest ingredients from top-rated farms and ranches. The hotel's Executive Chef incorporates a broad variety of Hill Country game meats to the menu and uses indigenous herbs and spices to reflect New American cuisine with a strong regional flair of the Texas Hill Country. Guests may dine indoors in the multi-tiered dining room or al fresco and watch river barges float by on the serene Paseo del Rio. Hotel is 100 percent smoke free. The authentic San Antonio hotel is located on the San Antonio River Walk across from its companion property the Mokara Hotel and Spa. The Omni La Mansion del Rio was recognized in the Celebrated Living magazine as one of the top hotels in the nation. A benefit to our guests at either the Mokara Hotel and Spa or the Omni La Mansion is that they have charging privileges at both hotels including restaurants as well as bars and the world-famous Spa. The Omni La Mansion is in the heart of San Antonio overlooking the beautiful Riverwalk. 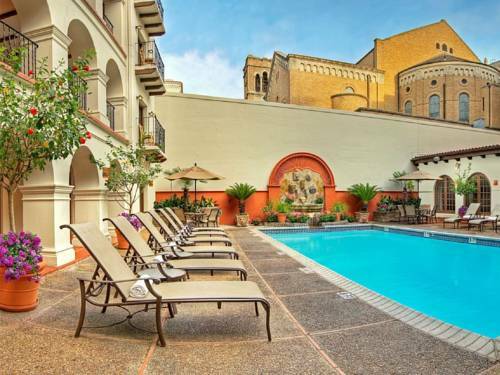 It is within easy walking distance of the fabled Alamo and El Mercado, as well as La Villita District, the Spanish Governors Palace and San Antonio Convention Center. Numerous shops and restaurants are nearby. The San Antonio International Airport is just 8 miles away. All reservations must be cancelled before 12 noon local hotel time 2 days prior to arrival to avoid a cancellation charge. Individual rate plans may have cancellation requirements that vary from the standard policy. Check specific rate description for complete details. The 338 room hotel has 16 meeting rooms with 15000 sq ft including the 3913 sq ft Iberian Ballroom that can accommodate groups up to 500. Most meeting rooms have windows for natural lighting. An experienced event and meeting planning staff is readily available for consultation. No free shuttle transportation to property. Downtown restaurant featuring upscale Latin food. Tower with observation deck restaurant and 4-D theater ride.